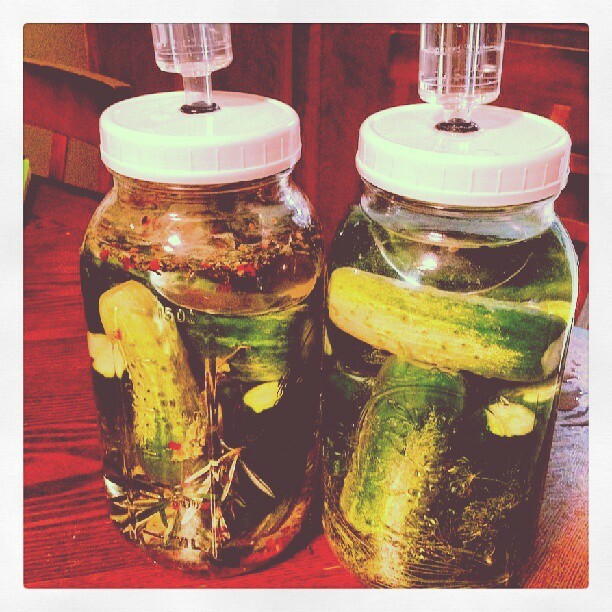 Now that I’m delving into this fermented foods thing… making pickles is just a no-brainer! I’m calling these Brine-cured… because they are… and also because most people wouldn’t go near anything called “fermented!” We have collectively forgotten that THIS is the REAL way our ancestors preserved things… not with chemicals and un-natural nasties… boo on THAT! So – I totally didn’t take any pictures of the process… just the finished product. I’m still learning this blogging stuff… so… just imagine loads of pictures of fresh cucumbers, dill and spices being artfully arranged and displayed below…. And then… the magnificent results! We got your Spicy Italian Pickles on the left and your Garlic Dill Pickles on your right. The Italian pickles are “half sour” and the Dill are “full sour” – It’s just a matter of how much salt you put into the brine… who know, right?? Place a weight on top to keep cucumbers submerged. Cover with airlock jar (or pickling lid/weight of your choice) and a towel. Sit on your counter or in a cabinet. And now… you wait. You can try them in about 4 days and see if you are happy with the flavor. Most people let them go for 1-4 weeks. When they taste the way you like them, put a regular lid on them and keep them in the refrigerator. “Added to 1 quart of water, each tablespoon of sea salt (weighing about .6 ounce) adds 1.8% brine. So 2 tablespoons of salt in 1 quart of water yields a 3.6% brine, 3 tablespoons yields 5.4%, and so on. In the metric system, each 15 milliliters of salt (weighing 17 grams) added to 1 liter of water yields 1.8% brine. I’d love to hear if you’ve tried this yourself… what your results were/are… and what else you’ve tried to pickle. Previous I’ve been creating… now it’s time to PHOTOSHOP these bad boys! Sounds TASTY!! I want to try them! I gotta get a handle on this kombucha first! I made the spicy garlic dill pickles last year, probably around July 2014, I made 4 quarts, they didn’t even last through the month of September, they were amazing! Absolutely loved them, I saved your recipe on pinterest and pulled it up to make it again with the small picklers I bought at the grocery store yesterday, this time I will be making 2 half gallons, I’m pretty sure these won’t stick around here for very long either! Thank you for the great recipe!